Israeli security forces on Wednesday assaulted Egyptian Coptic monks and arrested at least one during a protest against the restoration of an ancient monastery in Jerusalem believed to belong to the Egyptian Coptic Orthodox Church, according to the Palestinian Maan news agency. The Coptic Christian clerics were demonstrating against repair work planned to be carried out by the Israeli government at the Deir Al-Sultan monastery in Jerusalem's Old City without the Coptic church's consent. The incident stems from a decades-long dispute over the ownership of the monastery, which is now run by the Ethiopian Orthodox Church. A number of Israeli court rulings ordering that control over the monastery be handed back to the Copts have not been enforced. Eyewitnesses said Israeli forces physically assaulted the monks on Wednesday to allow municipality staff to enter the monastery to carry out repair work, according to Maan. 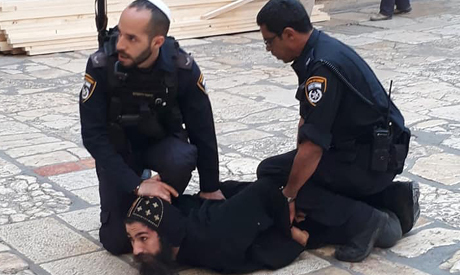 Local and Palestinian news websites published photos of Monk Macarius Orshalemy, who has been arrested, being dragged and pinned to the ground by Israeli security forces. Sky News Arabia said tens of other protesters have been arrested along with the monk. Coptic Church leaders have been in contact with the Egyptian embassy in Tel Aviv and the Egyptian foreign ministry to resolve the matter, it added.